During my series on unusual greens in 2006, one of the entries focused on what I had been told were “okra leaves.” Two astute commenters, however, pointed out that the identification I have been given by the farmer was probably incorrect. 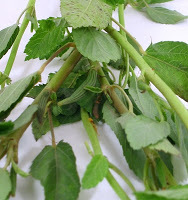 In the first comment, Katie, noted that some farmers call leaves from the jute plant “okra leaves” because they produce okra-style slime when cooked. In the second comment, beautdogs, pointed out that the leaves in my post look nothing like okra leaves and so I had been misinformed (and a bit negligent in my research). I didn’t think about the post for a long time until a plant-obsessed friend saw the post and decided that she had to figure out exactly what this plant was. Her research confirmed Katie’s comment: the plant was jute, specifically, Colichortus olitorius. Jute is well known as a source of fiber for cloth and rope making, but it also has culinary and medicinal uses. The Center for New Crops & Plant Products at Purdue University reviews the characteristics and uses of jute Colichortus olitorius; the University of Melbourne’s plant name database contains a list of names for the plant in various languages. The Vang Family stand [at the Berkeley Farmers Market] was very crowded when I walked into the market, so I didn’t stop to check out what they had. On my way out, I stopped to pick out some okra from them and happened to be there just as Mr. Vang went into his van and took out a giant bag (garbage bag size) of Corchorus olitorius for a Middle Eastern woman (possibly Egyptian?). She bought every last bit of the stuff. Naturally, I wandered over with questions. 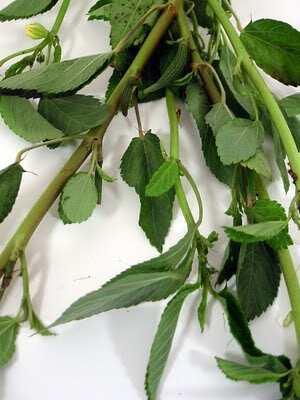 (a) She confirmed that this Corchorus olitorius is molokhiya. She uses some fresh and the rest is dried for later. (b) They both agree that it is slimy/sticky when cooked. Since he grows both the Corchorus and okra he is perfectly aware that the two leaves and plants are very distinct. His theory about the “okra leaf” name was that that might be referring to the sliminess/stickiness of the leaf: not “leaf of the okra plant”, but “slimy like okra” leaf. (d) He also told me that a lot of his Filipino customers buy this green. He said the Filipino name is Saluyot. Interestingly enough, Filipino recipes online seem to recognize that it is jute. I hope that this clears up any lingering confusion. Thanks to my friend for her diligent research.